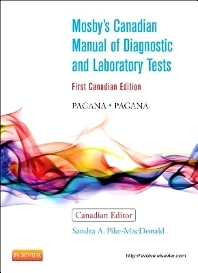 The very first resource of its kind, written exclusively for Canada, Mosby’s Canadian Manual of Diagnostic and Laboratory Tests provides clear, concise coverage of more than 700 of the most commonly performed tests, with Canadian lab values, SI units, Canadian cultural considerations, and more unique Canadian content. Its many user-friendly features include an easy-to-understand writing style, full-colour illustrations, and a logical organization. Each test entry is presented in a consistent format to provide quick access to information on specimen collection, normal findings, indications, test explanation, procedure and patient care, and test results and clinical significance, as well as any applicable contraindications, potential complications, interfering factors, and related tests.